Although reference to the concept of the American Dream was made as early as the 1600s by those who came to America from England for the chance of a better life, it was most likely “codified” in the Declaration of Independence, which proclaims that “all men are created equal” with the right to “Life, Liberty and the pursuit of Happiness.” Part of this right and critical to achieving the dream are the opportunities to receive a good education and work that provides at least a living wage. But, the game is now stacked. Stacked in favor of the wealthy, stacked in favor of corporations, stacked against the middle class who is increasingly squeezed, and stacked against children who don’t come from a family of means. Of course, everyone has a different idea about how to “unstack” the deck. In fact, as I mentioned earlier, some don’t even see the deck as unfairly stacked. I am firmly in the “”deck is stacked” camp and believe if we don’t start to make progress at turning the tide, pitchforks may be in our future. In Arizona, Governor Ducey thinks the way to move our economy forward is vouchers and charter schools, no individual state income tax and very little tax on the corporate side, and oh yeah, the “sharing economy.” Really, a “sharing economy”? Could it be that Ducey and I agree on something? I mean, I think it would be great if we would all share equally in our economy. After all, when Arizona’s top 1% pays only 4.6% of their income in state and local taxes while the bottom 20% pays 12.5%, we could really use some sharing. What you say? He was referring to “sharing” type businesses like Über and Lyft where the services are cheap and convenient, but the workers have no rights or benefits? Oh, okay, that sounds more like current Arizona leadership. Just for kicks, let’s look at another state’s version of the way forward. Interestingly, Massachusetts has almost exactly the same population as Arizona, 6.8 million. Both states also have the Tea Party in common although with Massachusetts, it is mostly in their past (as in Boston in 1772) and in Arizona it is very much in the present. Politically, Arizona is GOP led with no statewide Democratic leaders and both the state senate and house under GOP control. Massachusetts conversely, is almost entirely led by Democrats with the exception of their governor who is a Republican. Given the political parties’ priorities, it should be no surprise then that M assachusetts ranks much better in education and child well being than Arizona. What may surprise some though, is that while Arizona’s economy ranks 25th in the Nation, Massachusetts’ comes in at #6. Why might you ask? Well, I have a few theories and as you can imagine, the state’s prioritization of public education is at the top of my list. Take Career Technical Education (CTE) for example. It produces significantly higher graduation rates than traditional district high school programs, often provides living wage jobs to graduates, and helps provide skilled workers for the employers who so badly need them. It is, by all accounts, a win-win-win. Massachusetts Governor Charlie Baker obviously gets this as indicated by his recent proposal to add an additional $83.5M for vocational education. Included in this is a $75 million five-year capital program to finance grants for school equipment and expansion an additional $8.5 million for grants for “school-to-career connecting activities. At the same time, we have Governor Ducey objecting to restoring the $29 million in cuts to CTE made in last year’s budget. Instead of embracing the AZ Legislature’s veto-proof coalition to restore the funding, Ducey wants to only restore one-third of the funding for only three years and, attach a variety of strings to the money including a requirement for business matching of the funds. This despite a plea for repeal of the cuts signed by 32 business and education leaders as to the importance of CTE. Maybe Governor Baker just had better advice than Governor Ducey. Tim Murray, a regional chamber of commerce president who toured 64 votech and agriculture education programs when he was the Lieutenant Governor of Massachusetts, said “the single biggest need” of the business community “regardless of the size of the company, regardless of the sector” is a “pipeline” of available workers. Surveys of 352 employers and 475 parents recently conducted by The Dukakis Center in Massachusetts revealed that 90% of employers see a need to increase CTE graduates, while 96% of parents had a favorable opinion of the CTE programs they children attend. But wait, there’s more. I believe one of the best determinants of the value someone or an entity places on something is what they are willing to pay for it. Massachusetts obviously values education. I know there are those of you ready to say: “there are plenty of examples of more money not producing better results.” Yes, that is true. But in almost every case, I’d be willing to bet where money doesn’t help, there are significant social issues outside of the schools that keep students from learning and achieving. It is obvious, by Massachusetts’ #1 ranking in education achievement, that their money is well spent. Of course, as mentioned earlier, we know there are factors outside of the school that determine how children do in school. Massachusetts has lower unemployment, their residents earn higher salaries and they are less likely due to lose their homes to foreclosure. Their residents are also better educated, safer, and healthier. They also have fewer disabilities, likely from the better health care they experience. It should be no surprise that Arizona also has four times the adults in state prison as does Massachusetts, spending hundreds of millions more in this area. Yet, Arizonans are no safer with over double the murder rate. So let’s recap. Massachusetts performs better than Arizona in education, child welfare, health and safety, the economy and many other areas. Yes, taxes are a little higher ($1,706 per person in 2013), but look what you get for your money! I’m well aware of course that this line of reasoning will fall on many a deaf ear that think the only good government is a starved one. It can’t be said enough though that taxes are not bad or good, they are the price of living in a well-functioning society with a decent quality of life. There are many things such as education for all and safety that are best provided by the government. It our duty (the voters) to determine our priorities for our hard earned tax dollars and then elect candidates that will ensure those priorities are provided for and secured. That is how we keep ourselves free. Prop 123 is not about the kids. It is about politics. 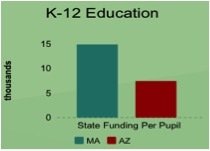 In 2000 Arizona voters passed Proposition 301 which called for annual inflation adjustments to the base education funding formula. Since 2010, the state withheld this funding. This was a slap in the face to those who voted for Prop 301, because the State has withheld over a billion dollars, all of which was supposed to go to public education. In essence the state has ignored the voice of the public even though in 2013 the Arizona Court of Appeals said the state is to pay all the back money it owes to its public schools. The State’s response was literally the equivalent of telling the public to “jump in the lake.” The state refuses to pay this debt it owes its public schools. Now the state is proposing another concept, which is being rolled out to the public for voting. It is Proposition 123. The State once again is asking voters to support Prop 123. The State claims Prop 123 will not increase taxes but will support public education to the tune of $3.5 billion. It really sounds like the State is bending backwards and being overly generous. BUT . . . The State still owes an outstanding debt to its public schools, to the tune of approximately $1.7 billion dollars from all those years it withheld monies beginning in 2010. So if you factor out that figure of $1.7 billion from the $3.5 billion the State wants to spend, from the school children’s own piggy bank of the Land Trust Fund, well what are you left with . . . $1.8 billion. Sounds good, doesn’t it? Yet, a vote for Prop 123 means school districts give up their right to sue the state for the $1.7 billion the schools are already owed. Seems to me the State is once again bamboozling the public and denigrating the voice of the very people it asked to support the original Prop 301. It is all about politics and those in power at the State level, who want you to believe that you really do have a vote in these matters. When in fact, the State has the power to ignore and toss out voter input when it is convenient to the State. It is not about fighting harder once Prop 123 is passed. Once this Proposition is passed, and based on the State’s past rejection of voter input, how does one know the State won’t ignore the tenets of Prop 123 as well? Once the State pays the back monies it already owes schools, then and only then can one consider anything like Prop 123. There are many websites one can go to understand why Prop 123, at this point in time, is a shallow political response to the funding of public schools in Arizona. Really appreciate your comments Pat, can’t argue with a lot of what you said. I especially agree that our state leaders have a record of rejecting voter input. That is one of the reasons I believe it is critical to pass Prop 123 and get some money into our schools now. Then we work toward the real solution which is to elect more pro-public (district) education candidates. That is the only way to affect real change over the long haul. I am with you in every respect but you cannot ignore that there are so many people who make their bacon in Manhattan and Boston and live their lives in Massachussetts. Good point Eric! Thanks for reading and for your comments. This can be solved in a simple way. Democrats and Independents need to vote in off year elections. There has to be a movement on every level of state politics, from city to county to state, by Democrats and those with interests in such areas, to make these issues personal to the voters. The special interests and far right have been brilliant at this. Through zeroing in on scare tactics such as the immigration issue and stirring the anger of their constituency. This along with confusing issues through advertising and poor ballot writting they have managed to develop apathy on one side and determination by a small group to get to the polls. You are so right AV…therein lies the rub! republiscum don’t behave themselves out of decency because they are not. you can not shame the shameless look at flint michigan. republiscum will behave themselves out of fear! what are you doing to make them fear? what do they fear? the rising latino vote hence vote suppression. they fear young raul grivalja’s not white elitist good government liberals. you want to be wendy davis instead of raul grivaldja. as in texas the majority of white women vote republican the majority of hispanics vote democrat! abortion rights are so importent to you that the way to protect right to choose will be easier to achieve with a large hispanic vote turning arizona fro meed to blue. fred duval found out the hard way appealing to republican women voters doesn’t work. any white person who will vote democrat already does! 70& of white people vote republican in 2014 70% of hispanics did not! You are right Capt A…so what do we do about it? So how do we unstack the deck? Certainly not by passing Prop 123 and giving Ducey a win that will guarantee his reelection and the reelection of Republicans statewide. Hi Boor. Listen, I get it. I found myself happy that the Cardinals lost to the Panthers because I didn’t want Ducey to somehow be able to brag about THAT win. But, every time someone says they don’t to “give Ducey a win” by voting for Prop 123, it just feels like it is more about politics than about the kids. I say pass 123 and then fight twice as hard. If you think that I want to use Arizona’s children as a political football simply to win seats for the Blue Team, you are mistaken. It’s not about just denying Ducey a win either. I am afraid that if Arizona voters approve this sh*t sandwich of a settlement, it’s the last money that Arizona public schools will see for a long time. It will be sold to the public as “Mission Accomplished”. I can just hear Republican legislative leaders now: “We just gave them $3.5 BILLION DOLLARS and now they want more?” The same people who don’t want to fund public schools will be reelected. The pressure will be gone and Arizona’s public schools will never be adequately funded. Game over. Facts. Don’t cloud my mind with facts. Beliefs and anecdotes should be what what drives the legislature. You know, laws that solve non-existent problems. We certainly don’t want any expansion of voting rights. After all it is my belief that maybe the wrong people might vote. Of course with JTED’s we have factually successful students and great programs that meet state of the art industry standards! With tons of reports going to the Dept. of Ed., available for anyone to review. But it is my belief that JTEDs should be more accountable to the governors office. This belief helps no student or industry, but by gosh I believe it. Putting those two subjects together, every JTED was only formed after approval by the voters in their partner districts, with the understanding they would partner with State funds. But as with Prop 301, I believe those voters did not know what they were doing. So apparently says Ducey and Biggs. Sorry Frances, lost my mind for a second. Thought maybe, just maybe, reason could prevail. Truth is, the problem on our side of the fence is we think facts and reason should drive our decisions. Unfortunately, we need to figure out how to make emotional appeals work for us. Of course “facts and reason should drive our decisions.” But emotions are primary. For example, check out The Righteous Mind by Jonathan Haidt in which he makes that case. The Republicans know this and have practiced emotional appeals for decades while Democrats have spoken volumes of policy papers. The Rs capture 90% of the audience’s psyche and we do not. I tried to make this point to 2014 state candidates but nobody listened so I will try again by reinforcing your conclusion. If we do not get the emotional appeals right, reason will not prevail. Absolutely Bill! Am reading The Righteous Mind currently and it is a great book. Dems do need to figure out the emotional appeal, facts won’t work. One sign of our times is that facts matter less than ever and I think that’s because there is no accountability for whatever is spewed out by anyone. People don’t really know who to trust so we just stay in our little echo chambers and get our viewpoints reinforced over and over. Figuring out how break in is the key.